I was less than thrilled when I heard we had a team building thing as part of the staff Coming Back Week, where all the staff from all of the offices get together for strategy work, training and other discussions. I quickly changed my mind, when I heard about what we were doing. When you work for an organisation that campaigns to make food fairer, you don’t get to experience team building exercises like yomping miles through a forest, or trying to get two people from A to B over a 2 m high obstacle with two bits of rope and a plank of wood. No, luckily for us; we get to cook. 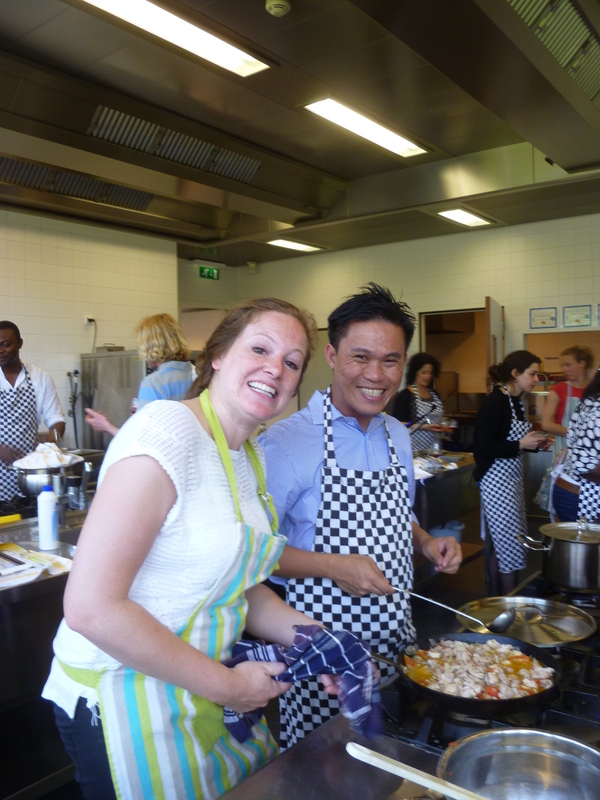 We were going to experience Surinamese cooking. 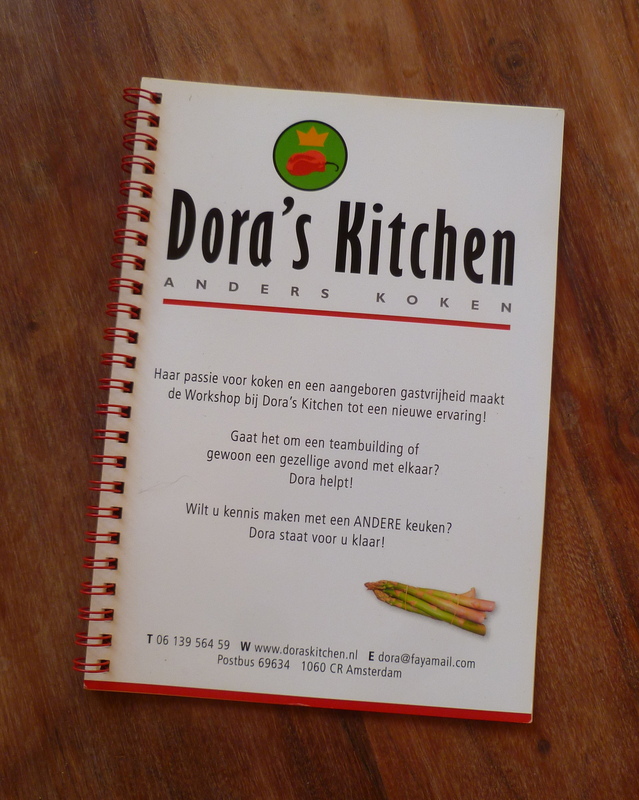 We were ushered in by Elizabeth of Dora’s Kitchen, who greeted us all with a big smile, a plate of tasty snacks and some delicious fruit drinks. 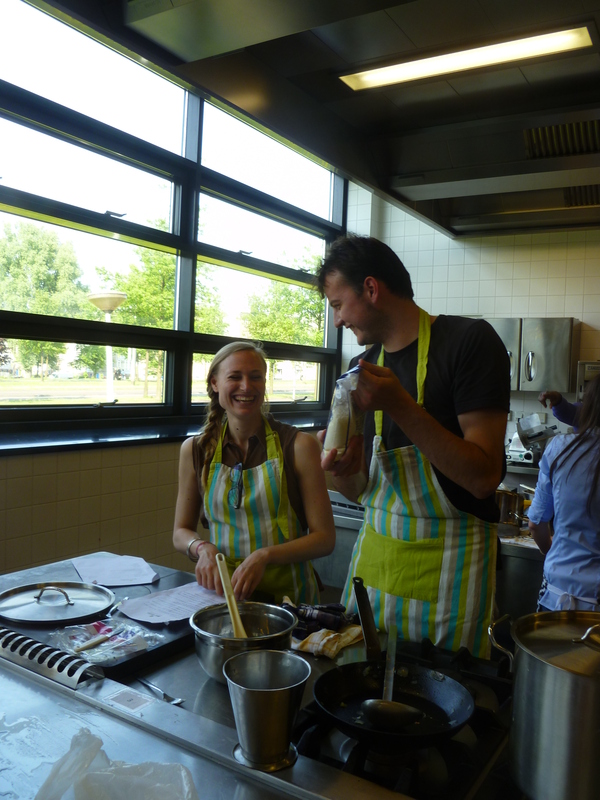 Their motto is “Anders Koken”, which translates as “Cook Different”, and this was my first attempt at Surinamese dishes, my first ever cookery class, and it was certainly a different team building exercise. I think they lived up to their motto. 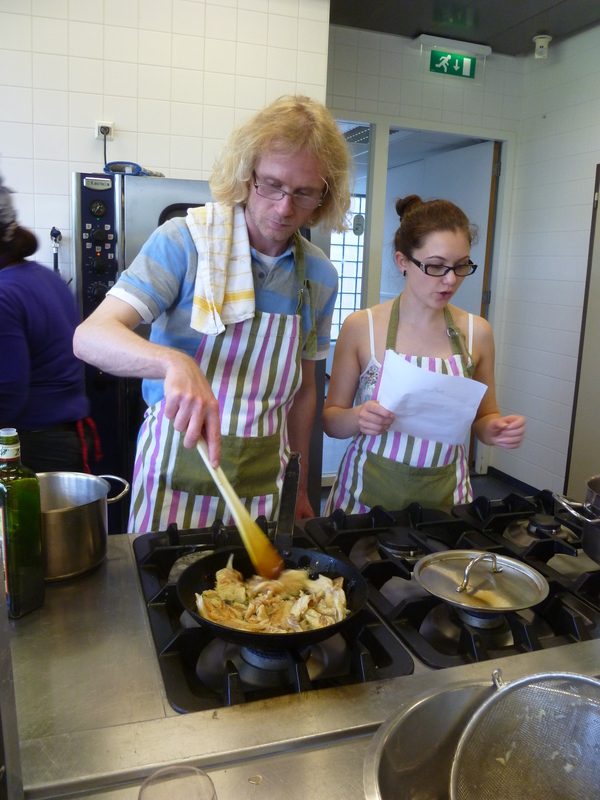 After setting the tone for the day, we were divided into smaller teams, and found out what we would be cooking. The choices were Peanut Butter Soup, Bacaljauw moksi alesi (salt cod with coconut rice), Fruit Punch, Spicy Baked Aubergines, and little pastries (I didn’t catch what these were called). 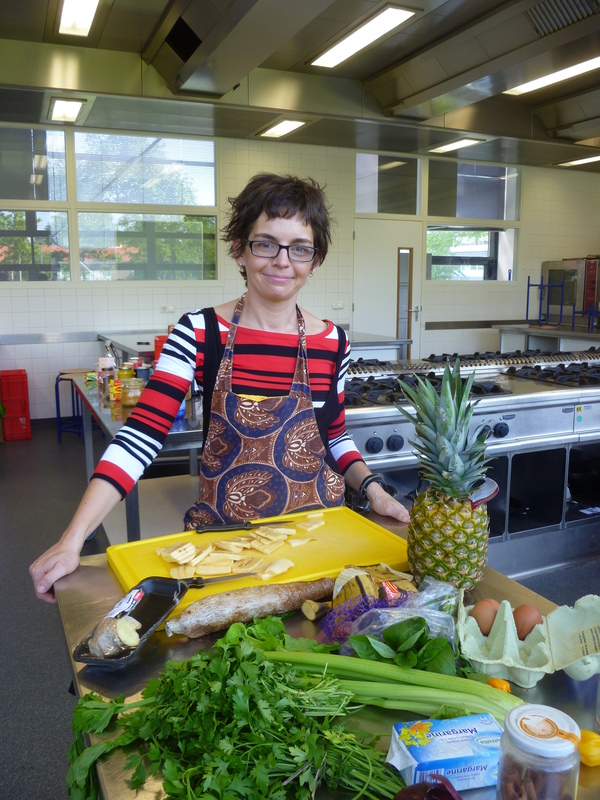 I have to say, I was a little sceptical, at the sound of some of the dishes, especially Peanut Butter Soup. 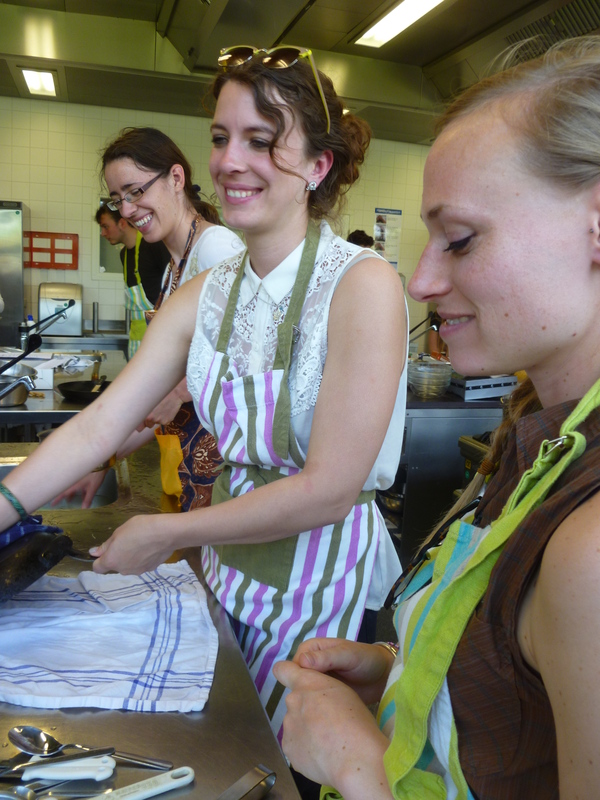 I was in one of the teams tasked with making the bacaljauw. 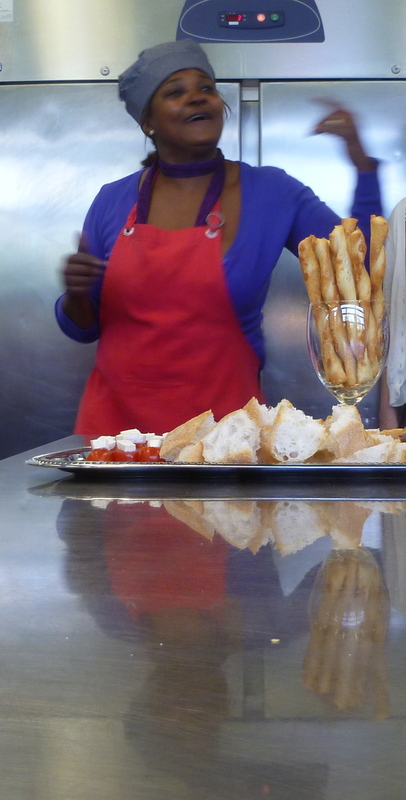 This was more about team building than I had anticipated, because the recipe was a little baffling in parts. 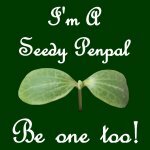 At first, I suspected that this was because it had been mangled by an online translation engine, but then I came to the conclusion it was to encourage us to work together to work out what it meant. Team members were swapped around after a little while, but the work carried on. It was interesting to learn about some new techniques, and from the buzz in the room, it seems that the rest of my work mates thought so too. Despite the seeming chaos, it all came together pretty well in the end. 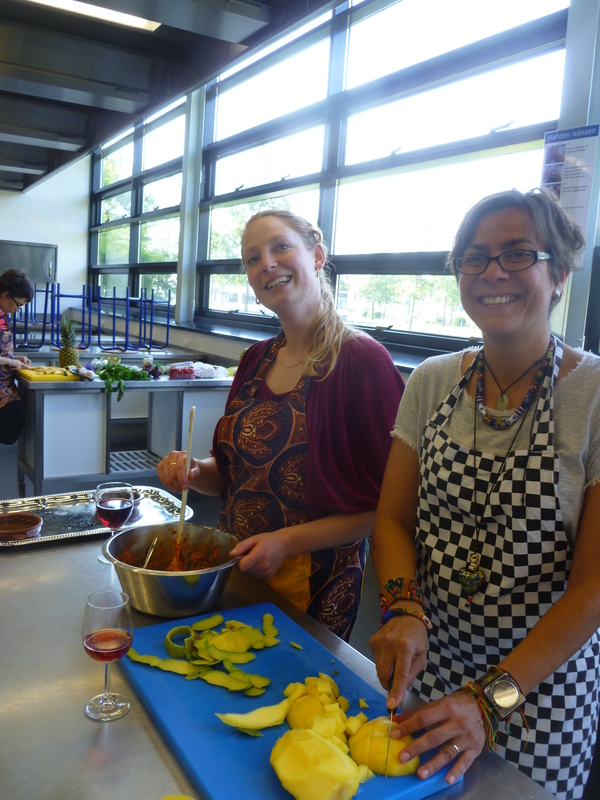 We managed to produce dishes that the Surinamese teachers were pleased with. 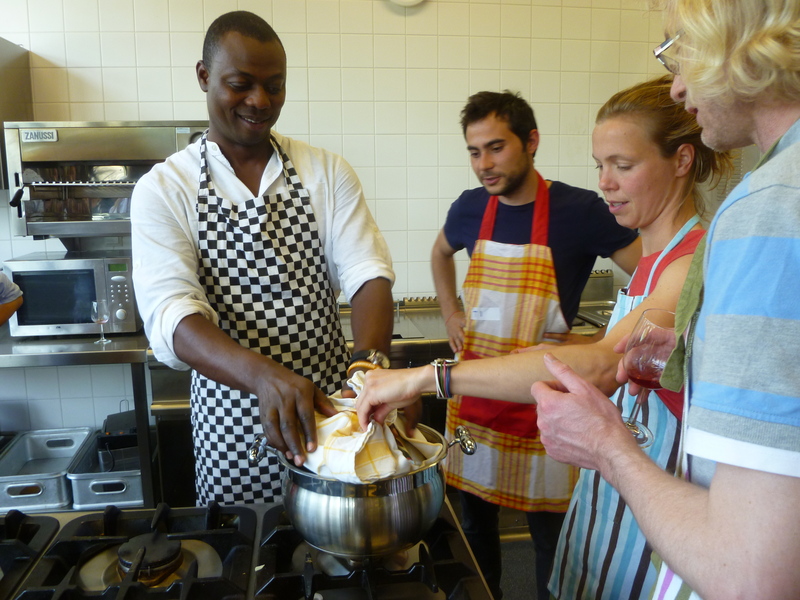 Although the teachers were all very keen that the Madame Jeanette peppers (they are a bit like Scotch Bonnets) didn’t go into any of the dishes too soon. All spicy food over here is toned down for the “Dutch palate”. I find it really funny that a nation who got very rich on trading spices around the World don’t appreciate the heat of many of the dishes that people make with them. The best part was that we got to sit down together and eat the fruits of our labour. I loved the event, I thought that it is a great way to get an organisation to come together and share an experience. And it turns out that everything was delicious, too. Even the Peanut Butter Soup – who knew? 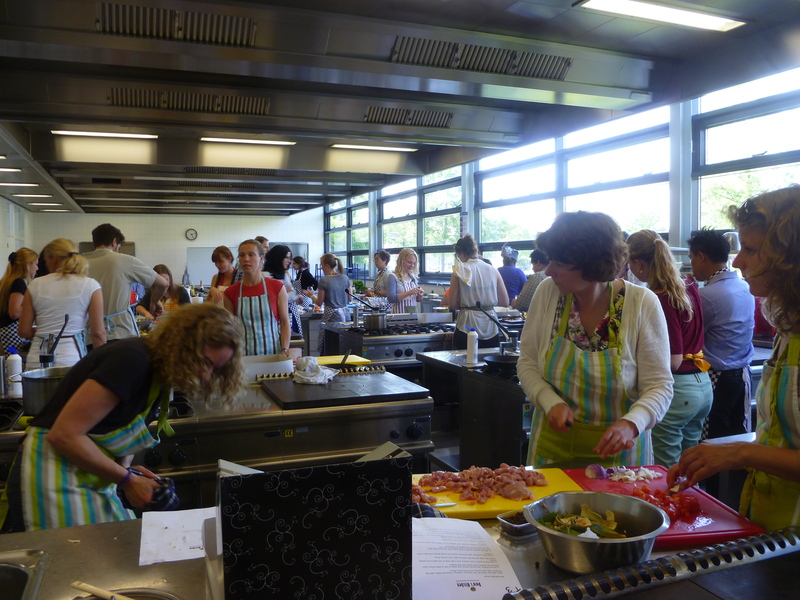 If you are responsible for organising a team building exercise, and you like your colleagues, then I’d recommend giving a cookery workshop a go. Obviously, please don’t try this at home if you work with people who should not be in a confined space with sharp knives!